Hobo Mama: Can you spare $1 to help Baby Sean? On June 10th 2012, Baby Sean was born. He is truly a miracle baby and both he and his family need our help. A fellow blogger with Natural Parents Network shared Baby Sean’s incredible story with us and asked if we could reach out to our friends and fans. Jennifer of Hybrid Rasta Mama is hoping to raise $1,000 over the next several days to help both baby Sean and his family as they face the lofty challenges in front of them. 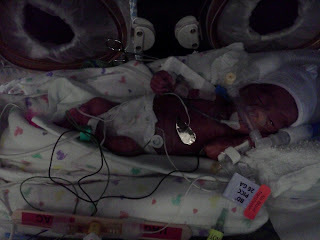 Please take a moment and read a little about Baby Sean’s journey and needs as shared by Jennifer. From 2001 until June 2011, I was fortunate enough to have five of the most caring, uplifting, generous and supportive people caring for my grandmother who suffered from dementia. This family literally fell into our lives and because of their selflessness, my grandmother lived 94 wonderful years. Without the care and support she received, I doubt that my daughter would have had the opportunity to spend two years with a great-grandmother who loved her, even when she did not have a clue who she was. Caroline was my grandmother’s main caretaker but her entire family (husband Tony and their three young children) did everything that my family could not. They bathed her, they cleaned up her bathroom accidents, they fed her nourishing foods, they told her stories, they took her to concerts, they took her camping, they took her to family events, and the list goes on. They lived with her 24 hours per day, 7 days per week with no time off. They embraced her and together, they become an expanded family. After my grandmother passed away in June 2011, I not only mourned her death but I mourned the loss of my extended family. Although I knew we would keep in touch, it would still be different. Fast forward to the end of May 2012. Caroline had been experiencing a headache that defied words. She decided to go to the hospital, knowing that something serious was going on. A short while after her arrival, she learned that she was 26 weeks pregnant and in a major health crisis. That headache was the result of preeclampsia and gestational diabetes. Both Caroline and her unborn baby were in serious trouble. Caroline was put on hospital bed rest where a fabulous team of doctors and nurses did all they could to keep Caroline’s baby where he should be…in his warm, watery womb. 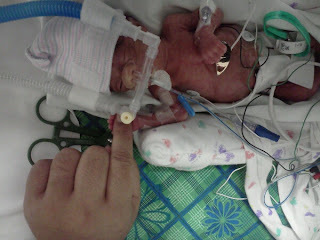 Unfortunately, Caroline’s placenta was too thick, her baby was not getting nourishment, and his life was in danger. After his heart kept stopping, Caroline underwent an emergency C-section to save both her baby’s life as well as hers. Fifteen days after walking into the hospital for a headache, Caroline gave birth to a 1 pound, 10 ounce, baby boy she and her husband named Sean Feleti Jeremiah Mokofisi. 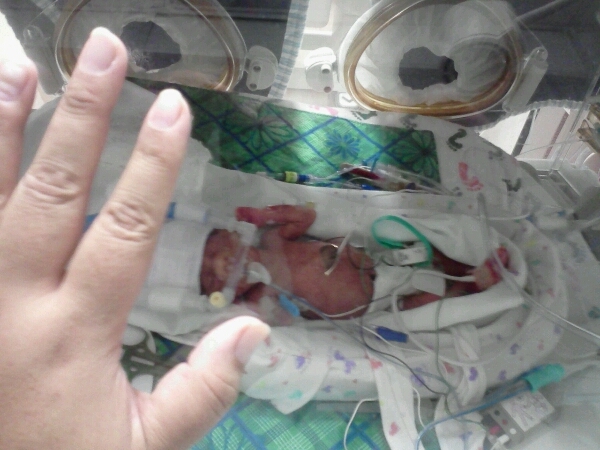 Baby Sean is a miracle. He is a fighter. And he has a long road ahead of him. However, Baby Sean is already breathing well on his own, a miracle and something pretty rare for a baby only 28 weeks gestational age. He has had some significant health challenges since his birth but has fought through them with the help of a wonderful and talented team of doctors. Baby Sean is not able to be held or breastfeed but Caroline is pumping milk and the hospital has been very supportive of her through this. They are also open to supplementing with donor milk, knowing how crucial breastmilk is to a premature baby. Caroline has had some health challenges as she recovers from not only the C-section but the preeclampsia and gestational diabetes. However, she is expected to be released from the hospital soon. Baby Sean is not so fortunate. His stay will be quite lengthy. Caroline and her family were already at a financial disadvantage before this incredible journey began. They work hard, they are generous people – giving to those even less fortunate than they are. They give everything they have to care for their children and give them the best life possible. But the economic cards have been stacked against them and the financial impact of such a lengthy and complex hospital stay for both Caroline and Baby Sean will be devastating to them. 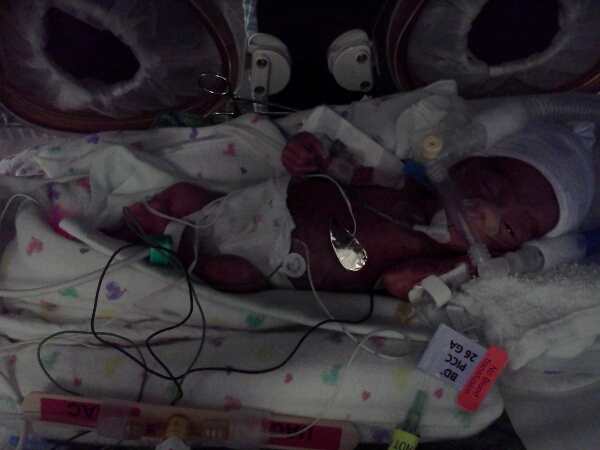 Once Caroline is released from the hospital, she will have to travel 45 minutes each direction to see her baby daily. The cost of gasoline is going to make this near impossible. On top of that, Caroline needs to begin preparing for Baby Sean’s arrival home and literally does not have the resources to purchase the most basic of baby supplies let alone some of the special supplies a premature baby with Sean’s health needs might require. Today we are reaching out to you. Could you donate $1 – just ONE DOLLAR – to help Baby Sean? Your donation will go towards clothes, cloth diapers, a car seat, and other premature baby essentials. In addition, it will help this beautiful family make the daily trip to bond with and bring breastmilk to their precious son. If you aren’t able to donate, perhaps you know someone who could. In lieu of a donation, we are asking for help in spreading the word. We know that in these tough economic times, it is difficult to know when to give and what cause deserves our hard earned dollar. This baby needs our help now! Imagine if this was your baby and all you needed was a little financial cushion so you could start your baby’s life out right? Caroline, Tony, their entire family and Baby Sean are already deeply grateful, humbled, and moved to tears by the mere fact that we are raising funds to assist them in their greatest hour of need. So thank you for your help. It literally will make a world of difference in this family and child’s lives. To donate to the Help Baby Sean fund, please click the DONATE button below. You will be taken to Paypal where you can donate even if you do not have a Paypal account. If you prefer, you can purchase a copy of Jennifer’s eBook, Coconut Oil For Your Skin, for $9.95. This increased price will be in effect June 20th and 21st and all sales from those days will go directly to the Help Baby Sean fund. Click the BUY IT NOW coconut below to purchase the eBook. Together, we WILL be able to help Baby Sean and his family get off to the best start possible. Again, thank you and many, many blessings for your generosity! Wow, amazing story. Sent them a little love. Hope the baby continues to gain strength.